I could see straight down the side of the cliff to the water crashing against the rocks about 1,000 feet below. 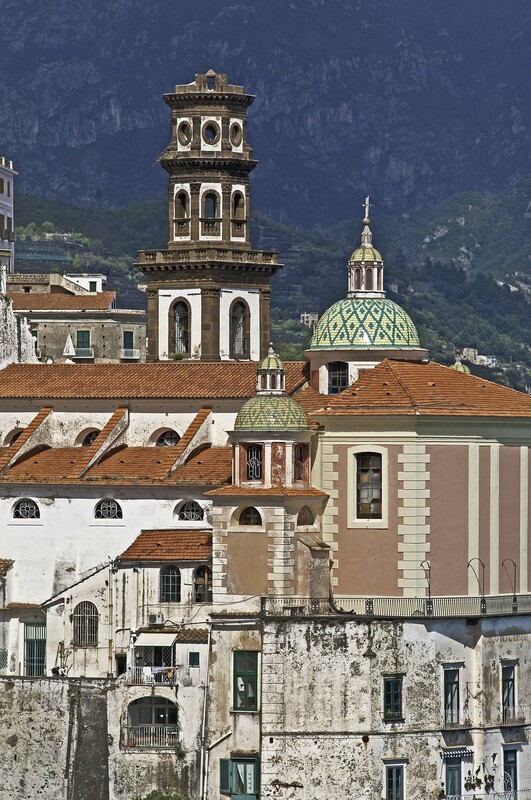 I’m sitting on a bus driving along the Amalfi coast and I can see my smile reflected in the window. The one I have when I go on a roller coaster ride. I can’t take my eyes off the things that have been built as if they are emerging from the side of the hills or terraced on a cliff. Swimming pools seem suspended over the water below me. My wife and I spent five days in Sorrento and though we had a car, opted to take the bus to Amlfi so we could relax and enjoy the view. It was cloudy but clear without much traffic so our progress was about as good as it could be given that I was sure some of the turns and tunnels would not accommodate our bus. We were a little disappointed with Amalfi. The town levels out at the shore, so there is more room than Positano for buses to park, so more tourist groups end up here. This makes for a much more touristy and busy area, lacking in the charm we thought we would find. Sitting at a café at the edge of town you have to look past rows of buses to see the water. A short shower drove us under an umbrella for some wine and pizza followed, of course, by gelato. 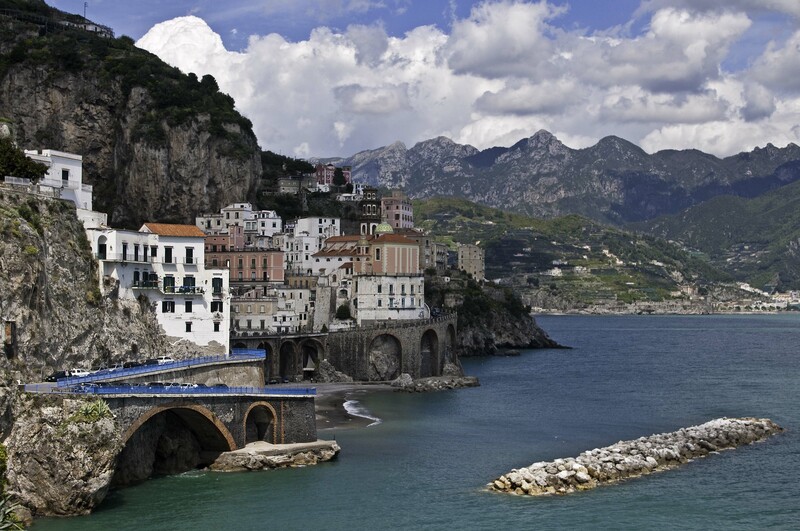 We decided to follow a path to the neighboring town of Atrani rather than stay in Amalfi. The walk is mostly up, followed my mostly down to reach Atrani. 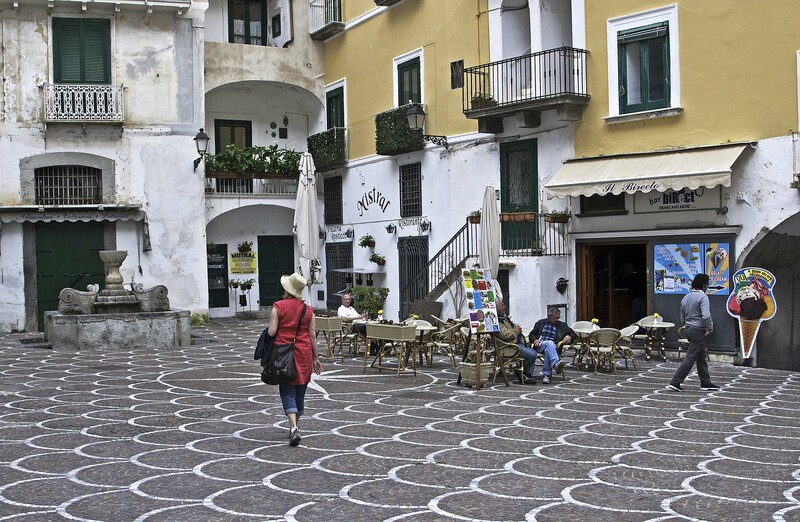 We emptied into a piazza with a little café and a couple of local residents enjoying a coffee and some conversation. The piazza opened up to a beach through a gate in the wall. We sat down and ordered wine and enjoyed the ambiance. 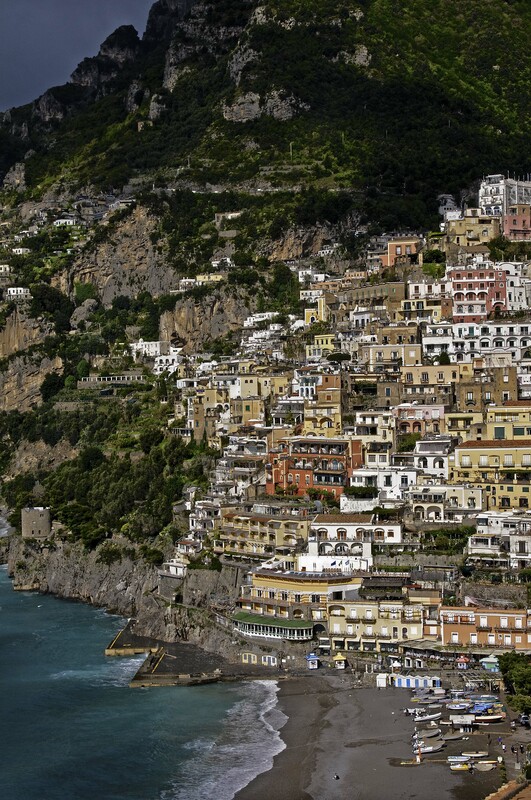 Realizing we didn’t have enough time, we decided to come back to Positano the next day. The return trip the next day by bus was just as much fun; you get to see all the things you missed the first time. Positano turned out to be the far better destination. The bus dropped us off at the “high” part of town and we walked down towards the beach area, visiting the shops selling linen goods and several of the outstanding art galleries. 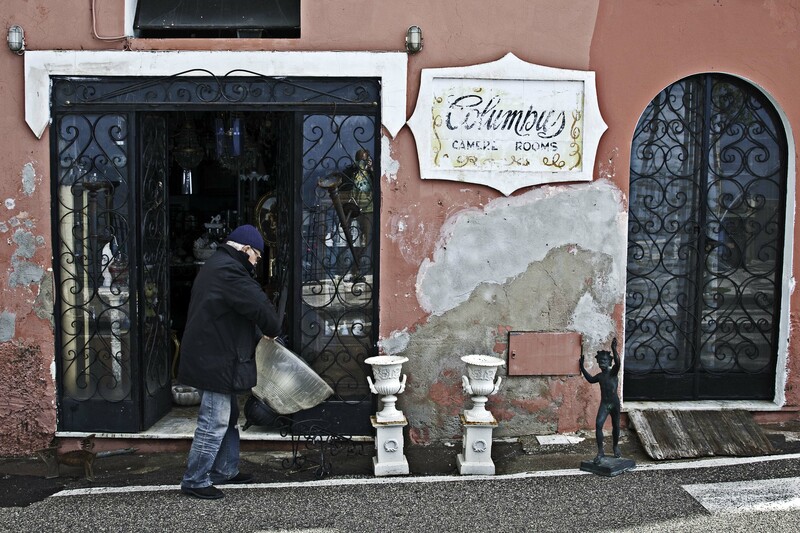 It has a very different feel than Amalfi; more relaxed; more real. At the beach, we encountered another splash of rain, practically a daily occurrence on this trip but easily weathered with a glass of wine. When the sun returned we picked up a pizza and sat on the beach having lunch. From here we wandered along the shore to a more secluded beach, sharing a few moments with a couple from Texas. On the return trip, I spotted a number of young women lining up at the water’s edge anticipating a wave. 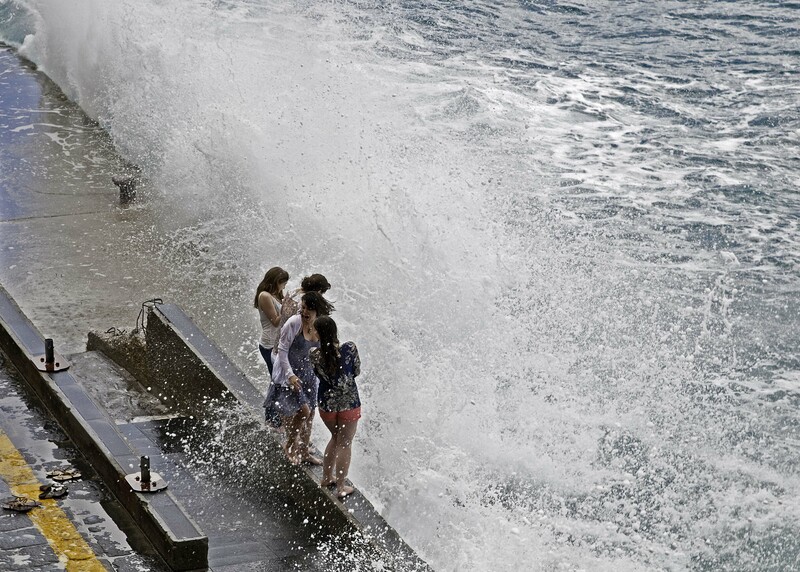 Camera ready, I waited and caught them, laughing as they were splashed by a bigger wave than I think anticipated. We slowly made our way up to the bus stop for our return trip to Sorrento, both of us adding Positano to our must-come-back-to list. This entry was posted in photography, Travel, Travel Photography and tagged Amalfi, Amalfi Coast, coast, Italy, outdoor photography, photography, Positano, travel photography. Bookmark the permalink. Beautiful! I see you’re appreciate the arts too? Awesome, awesome, awesome. Thank you. Absolutely love the arts – music, painting and writing.